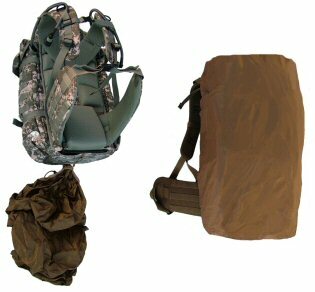 The Halftrack pack is similar to our G3M Phantom sniper pack; it's built from the same pattern as the Phantom's main pack. It's a front-loader, with two levels of varying-sized tuck-pockets lining its interior, Padlock system racks inside and out, and a fold-down shelf that can be used to divide the main compartment into upper and lower chambers. 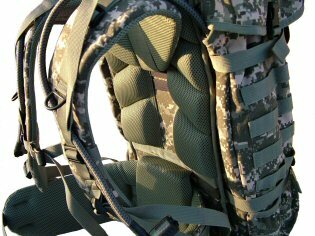 It will carry two 3-liter hydration kits, mounted in side pockets, or two 2-liter bladders in side-sleeves if you want to keep the main side pockets free for other gear. The waistbelt features a 6 x 2 Padlock matrix on each side. Sidewall tunnels allow carriage of long items such as skis or poles to be suspended from internal D-rings. A radio rack with large antenna portals is fitted to the back wall of the upper chamber. The pack features a robust internal aluminum and plastic frame, is comfortably padded with our deep-cut airmesh foam, and is well ventilated. Our Halftrack, we're proud to say, continues in this tradition. It's well-laid out. Tough. PALS webbing all over the place. Filled with easy access pockets. And, combined with our patent-pending Ripcord Gun Carry System (sold separately), it'll carry a heavy weapon aft of your shoulders, so you'll be more mobile. But what will surprise you is that you can get the gun off of your back while wearing the pack. We do, however, depart from the old halftrack in one essential way. Our pack is quiet, and made for comfort as much as anything else, because we know what it's like to live out of a backpack. 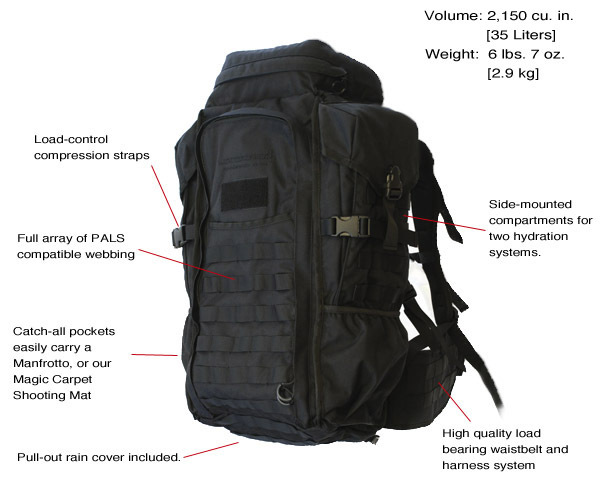 It will carry two 3-liter hydration kits, mounted in side pockets, or two 2-liter bladders in sleeves inboard of the outer pockets if you want to free the main side pockets for other gear. Tunnel pockets on either side have a D-ring at the top, which is useful for carrying skis, long poles, or other long equipment. It features a longer waistbelt, with a 6 x 2 PALS matrix on each side. We are confident that you will appreciate the quality and level of detail in this product. 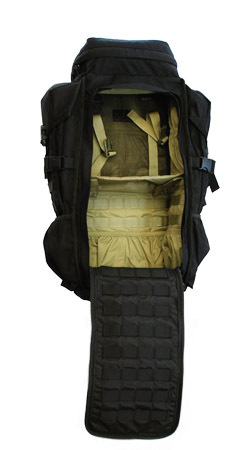 The Halftrack has our unique, hand-sewn support, padding, and ventilation system. You'll need to try one on to find out why so many people tell us that our packs are the most comfortable they've ever worn. 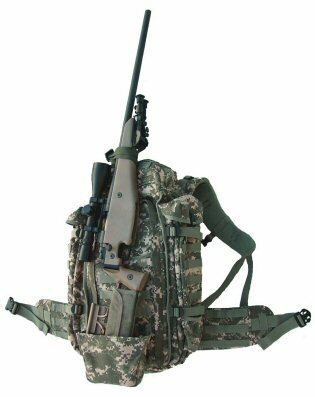 Our ButtBucket gun-carrier system, based upon our patent-pending Ripcord Bowtether, offers you a new way to carry a weapon aft of your shoulders, and to still be able to get it off of your back without removing the pack. Since you may ask us to compare this to our Backscabbard systems, we'll do it for you here: We like the Ripcord system for its simplicity, for its universality, and because beneath it all we have a very nice conventional backpack, which we've been wanting to make for some time now. The Ripcord is easy to use, works well, and will be a godsend for those who used to think that the only way to carry a gun was either in your hands or on a shoulder sling. For hard-core applications, and for carrying heavier weapons, we still prefer the Backscabbard (as found in our Phantom, Gunslinger, and Skycrane packs), because it puts the weight of the gun closer to your body. But the Ripcord's cool. It's a simple tool that can be added to any PALS-racked pack (meaning all of ours). The ButtBucket Weapon Carrier set is sold separately.